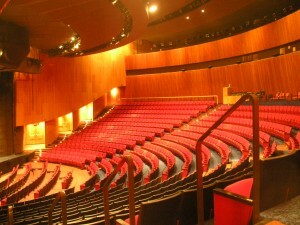 Fifteen comfortable tiered seating rows wrap around a dual hydraulic lift stage in the Kitty Carlisle Hart Theatre. Maximum seating capacity reaches 982, including eighteen seats in the special needs section immediately behind the back rail. Superb sightlines and generous leg room augment the pleasurable experience of attending an event in this theatre.